For several months now, I had been harping on the Saturn Uranus trine and how it behaves as a potent bull pusher and takes the markets higher.We are now approaching the potent second phase of this aspect. Saturn Uranus Waning Trine...This means Saturn will be approaching Uranus and some time in the future Saturn will form a conjunction with Uranus.In the present case, that aspect will happen in 2032, June. 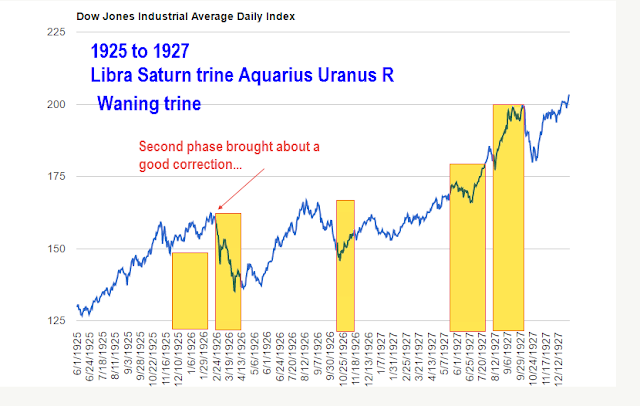 We will see two cases from history...Since 1900, we had a waning trine formation between Uranus and Saturn in 1925 to 29 and then again in 1972 to 74. So this is a rare aspect which happens once in 45 years.Since Saturn and Uranus have the habit of becoming retrograde, this passage will be in several phases.That is 3 to 4 times they will become trine before they finally move away. In 1925, Adolf Hitler wrote the "Mein Kampf", was released from prison, and began the process of using politics to gain power rather than brute force.That he succeeded against the wildest expectations of the World and that too with disastrous consequences is now part of History. Each coloured vertical bar represents a phase of Saturn-Uranus trine and we see that the second phase brought about a good correction.. 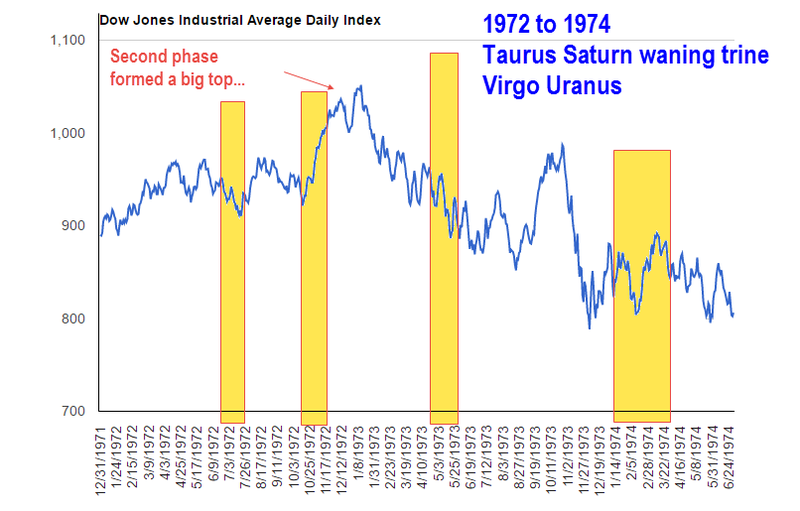 The next waning trine was in the period 1972 to 74. Again several path breaking events shaped up..
Water gate scandal broke out in the US. US gets heavily involved in the Vietnam war. US Dollar goes off Gold standard. This was the beginning of the Financial crisis which is unfolding and threatens to destabilise the entire Global Economy. We see that the Dow formed a major top during the second phase and declined heavily. Now to 2016-2018....Time for the next aspect of Saturn Uranus waning trine..
Donald Trump with no experience in Governance or in Military becomes the 45 President of the United States. Emmanuel Macron take charge as French President..
CIA alleges that Russia had acted to help get President Trump elected and that President Putin had personally authorised it.FBI subsequently concurs with CIA view. US President sacks James Comey, Director of FBI. Russian involvement is US Elections is taking a serious turn...similar to Water Gate..
Let us see the market..